How do we awaken to love? No doubt our answers begin with our life experiences and our age. We may feel it first in flames of infatuation. We may live it daily in the burn of our passions and committed relationships. We may give it in the glowing coals of our compassion. In her book Awakening the Energies of Love Anne Hillman explores a more profound theme launched by Pierre Teilhard de Chardin’s quote. Someday, after mastering the winds, the waves, the tides, and gravity, we shall harness for God the energies of love, and then, for a second time in the history of the world, humanity will have discovered fire. Our ancestors’ taming of fire symbolizes our species’ differentiation from all others. Eons later we find ourselves in another defining era. Our technology links us as a global tribe, while our fear and greed threaten our very existence. Led to listen to our better angels and our expanding consciousness, Anne challenges us to engage our capacities for transformation, the energies of love. 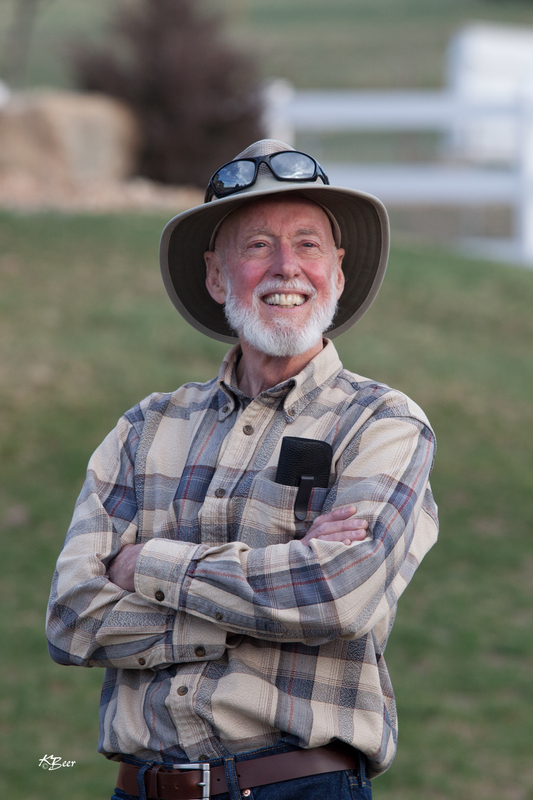 We too stand at an evolutionary juncture…a longing to be somehow more than we are… Our longing – our yearning – is part and parcel of the song of the soul, and it has always beckoned us toward a future that is not ours alone. We may choose to follow it by ourselves, but that we follow it matters to generations; for just as the embers of the first fire ignited the power of language, those of the second will ignite the power in our hearts. I highly commend Anne’s book. In a note last week to her parents whom we know well a young woman recounted a conversation they had almost thirty years ago. It ended with their mutual conclusion that it was time for her to leave home. It was not an easy decision for any of them. She was completing eighth grade. The prospect of her absence from her family as she grew into adulthood loomed large, but what prevailed over convention was a compelling gravitational pull. In was, in the words of Joseph Campbell, to follow her bliss, and for this young girl her bliss was dance. Her path took her many places. She danced in New York and venues in Europe, Russia and South America. She created her own company and along the way discovered a love of teaching. The occasion for her note of gratitude was the culminating performance for her Master of Fine Arts degree. She choreographed and danced in a 30-minute piece of her creation involving twelve other dancers. She chose the music and integrated graphics created by art students who attended one of her rehearsals. In the audience her parents beamed along with siblings, her husband and her daughter. Words from Kahlil Gibran came to mind. 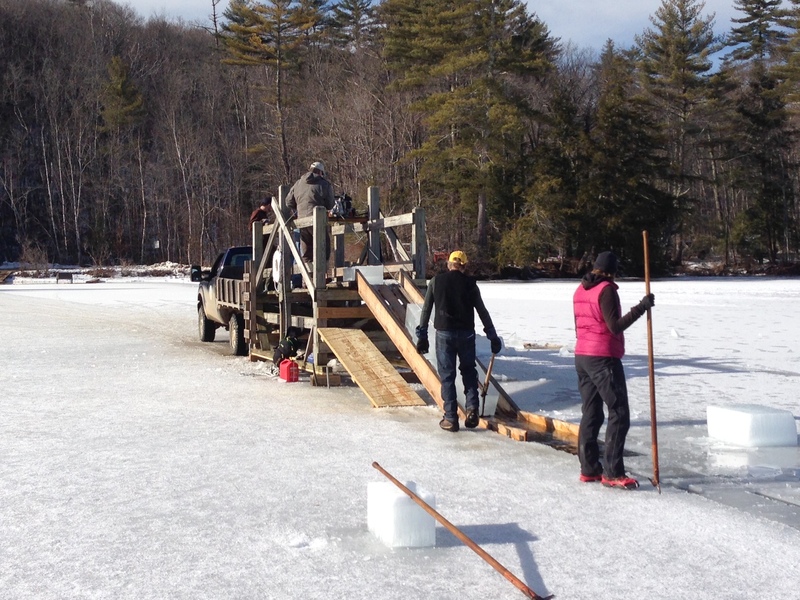 Last week I joined some friends in harvesting ice for their refrigeration system. Much more than an annual ritual it is only one element in the composition of their chosen path of homesteading. Living off the grid, they have been creating a life of self-sufficiency that nurtures mind, body and spirit and leaves a minimal carbon footprint on the planet. 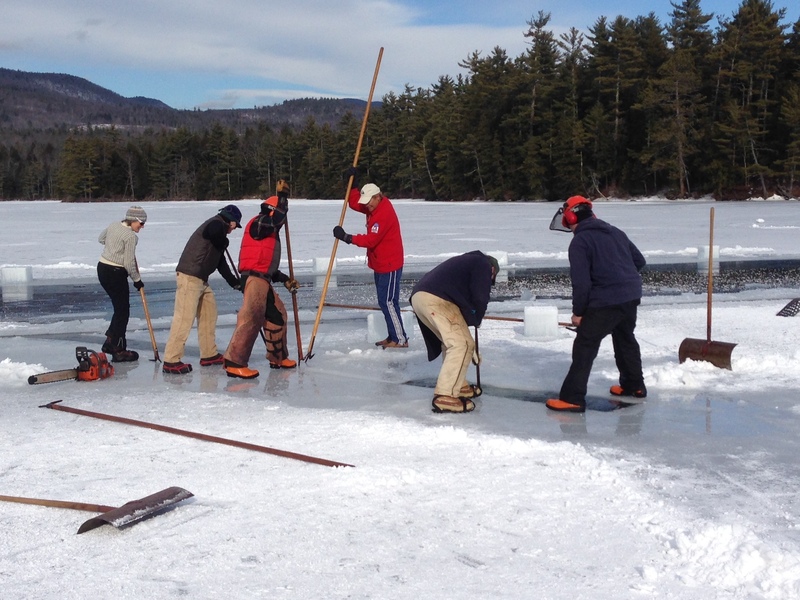 Cutting and retrieving 120 pound blocks of ice requires teamwork, and our friends are able to join with staff and volunteers of a local summer camp to share in the labor and harvest. A necessity before electric refrigeration began to replace the ice box, gathering hunks of frozen water has become an annual tradition of the Rockywold Deephaven Camps since the late 1800s. They continue to use the ice boxes of yesteryear for their refrigeration. As this 2-minute video of this year’s operation reveals, today’s ice-collecting methods include some contemporary tools – e.g., gas-powered saws, winches and trucks. 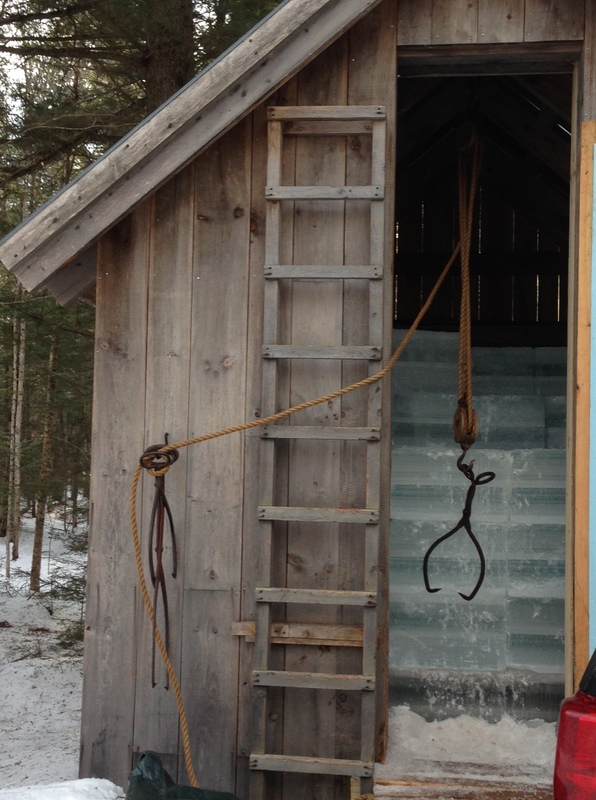 Sparingly, our friends use some of those devices as well for cutting and gathering firewood and transporting heavy loads, although they use manual block and tackle pulley systems to lift the ice blocks into place. Covered in a foot of sawdust to insulate them from the summer heat, the blocks are stored in an ice house and will last up to 12 months. 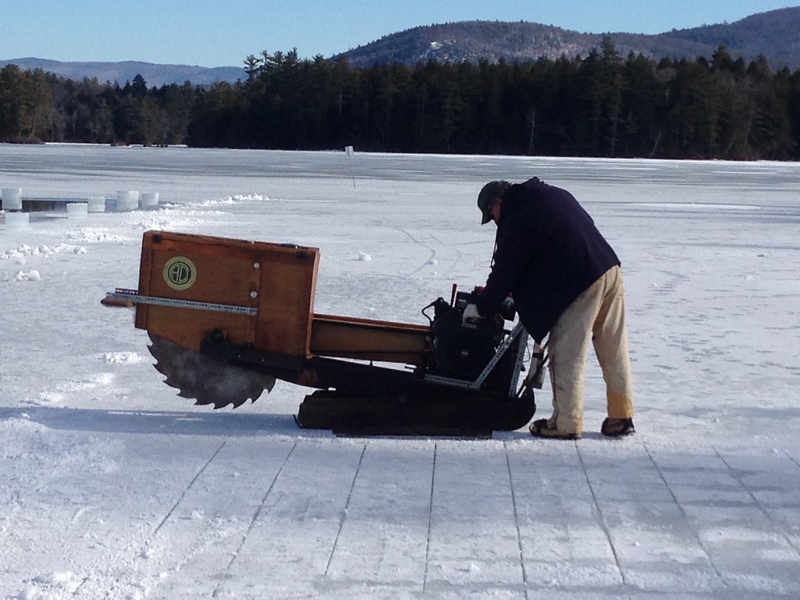 Harvesting ice is a throw-back for sure to days when folks tapped every resource available for survival in northern climes and banded together to help each other make it through the year. In today’s world of short-term grab for greed and convenience, I celebrate occasions that highlight both the ingenuity and determination of self-sufficiency and the mutual interdependence of community.